Bananas are usually considered to be alkaline. They are a good way to obtain fiber, vitamin B6 and potassium (it’s good for your heart and bones). It is possible to eat them anytime, for a snack or with a meal. In many low acid baking recipes, it is possible to mash them up as an alternative to a fat component (e.g. butter). Apples are a great source of fiber, too. Fiber will help you stay full longer, which often can minimize overeating throughout the day. Skinless chicken is a great low acid diet staple and an excellent source of protein (a 4 oz. portion provides 2/3 of your RDA). While poultry is perfectly fine, deep frying it will undoubtedly trigger heartburn. Salmon contains omega-3 essential fatty acids, which help the heart, joints, and eyes. Additionally, it can protect against some kinds of cancer. Just like chicken, the best Acid reflux recipes for seafood will reduce or exclude seasoning and spices (don’t forget to skip lemon too). For those who have Acid reflux, the UMMC (University of Mississippi Medical Center) recommends eating fish as well as other lean sources of protein and stay away from smoked, highly processed and pickled fish or meat products, for example sausages and pickled sardines, which can increase acidity. Oatmeal is an excellent breakfast alternative for people adhering to a low-acid diet. It’s an excellent source of filling fiber and will help stabilize blood glucose levels. When topping off a hot bowl of oat meal with fresh fruit, be sure you stay away from the ones high in acid (e.g. blueberries and cranberries). Brown rice may be a healthy choice if you’re following a low-acid diet. It’s an excellent source of fiber, which will help regulate the intestine, plus it’s heart healthy and chock full of Vitamin b, which can help maintain your body active. Unlike other nuts like pecans or cashews, almonds are alkaline. The mono unsaturated fat and omega 3 almonds contain may protect your heart plus their high dietary fiber content will make you feel full between meals. Almonds also contain E vitamin, a healthy antioxidant, and also manganese and magnesium. When making low acid recipes use almonds in preference to the other nuts. Most vegetables are great for low acid diets as long as they are cooked without a lot of oil. Whole grains, rice and oats make a great base for any diet and especially acid reducing diets. Avoid tomatoes, onions, most fruit juices, sour cream, fried foods, or any wine or coffee. Staying away from liquor and high-fat pastries like doughnuts, will also improve your condition. Does milk help acid reflux ? Q. Does milk help acid reflux ? A. Milk can only offer temporary comfort for acid reflux sufferers. However, they are no more effective than an ant-acid (as they both contain calcium carbonate). Ant-acids and milk not always cure heartburn, so it may not even give you a short-lived relief. Consuming too much milk to cure acid reflux can affect the enzymes in the stomach eventually leading to worse symptoms. Is yogurt good for acid reflux ? Q. Is yogurt good for acid reflux ? A. Yogurt can be great for strengthening the stomach walls and digestive enzymes. It can help with acid reflux because of the pain-relieving properties that so many acid reflux sufferers go through. Plain yogurt is the best. If plain yogurt doesn’t appeal to you, try adding a low-acid fruit to the mix, like bananas. Is ginger good for acid reflux ? Q. Is ginger good for acid reflux ? A. Ginger is great for acid reflux because of its anti-inflammatory properties. Buying ginger in its purest form is the best way to incorporate it for acid reflux and heartburn relief. Take fresh ginger slices, steep them in boiling water, and make yourself a cup of tea. Don’t be tempted to add lemon, as this acid can counteract the pain-fighting remedy. Does drinking water help acid reflux ? Q. Does drinking water help acid reflux ? A. Drinking a copious amount of water during meals can help dilute the stomach acid formed during digestion. By watering down the stomach contents, you are also speeding up the digestion process. If heartburn has already started to occur, drinking water can push the acid down that may have pushed up into the esophagus. Mustard for acid reflux ? Q. Mustard for acid reflux ? A. Although some people claim that mustard helps acid reflux, it actually should be avoided. Mustard is a weak acid and vinegar which can further aggravate heartburn symptoms. Although some that believe in natural remedy believe that swallowing a teaspoon during an attack helps, it is all relative. There is no evidence that is neutralizes stomach acid. Are apples good for acid reflux ? Q. Are apples good for acid reflux ? A. Apples are a low-acid fruit and therefore safe to eat with those that suffers from heartburn. Apple juice, fresh and dried apples are also okay. Cider may be the only apple product that may cause acid indigestion and heartburn, so avoid that. Is vinegar good for acid reflux ? Q. Is vinegar good for acid reflux ? A. There is no evidence to concur that vinegar is good for acid reflux. Because stomach acid is the main culprit of heartburn, adding acid to the situation would not improve the pain. By adding more acid to the stomach acid that is already irritating the esophagus, you could potentially damage it more. Are bananas good for acid reflux ? Q. Are bananas good for acid reflux ? A. Eating bananas are a great way to relieve and avoid heartburn symptoms related to acid reflux. Because of their low acid content and their nutritional properties, they are great for your diet and help with the lifestyle change needed to relieve the regularity of symptoms. If you incorporate them into your diet regularly, they will help with the burning sensation of heartburn. Is soy milk good for acid reflux ? Q. Is soy milk good for acid reflux ? A. Soy milk has less fat than 1% or 2% of milk, leaving researchers to believe that it does provide some relief for acid reflux. Try substituting all dairy intact with soy alternatives; Keeping a detailed food journal during the week to track your acid reflux occurrences. If the condition improves, stick with it! Are almonds good for acid reflux ? Q. Are almonds good for acid reflux ? A. According to folk and natural remedies, almonds can help acid reflux. It’s recommended to eat five or six and it helps the indigestion and heartburn associated with reflux. Almonds provide great nutrition – carbohydrates, dietary fiber, and protein. Incorporating some into your diet can help! A. Mayonnaise can make acid reflux symptoms worse. Most fatty foods, cream based sauces, and oils can and will cause heartburn for those that are susceptible. A low-fat alternative can often times lessen symptoms. You don’t have to go without mayo on your favorite sandwiches, just be conscious of the fat and oil content. Are nuts bad for acid reflux ? Q. Are nuts bad for acid reflux ? A. No! Walnuts and almonds are great for acid reflux. Eating smaller meals and snacking on nuts in between to keep you full and relieved is an easy and natural way to reduce the pain. It is also a great lifestyle change as most nuts are nutritious and rich in good carbs. Stay away from nuts that are spiced or have artificial flavors. Are eggs bad for acid reflux ? Q. Are eggs bad for acid reflux ? A. Eggs do have the potential to aggravate your reflux. They are not great for acid reflux but not horrible either. Preparing your eggs is probably the most important way to avoid aggravation – Do not fry in a lot of butter and oil. Any fried foods have the potential of causing heartburn and discomfort. Are grapes bad for acid reflux ? Q. Are grapes bad for acid reflux ? A. Grapes should be consumed only at your discretion. They do prose a medium risk due to the acidity of the fruit. They can be completely fine, but this may be a fruit you want to avoid. They do not have the highest acid content of fruits, by any means, but can still pose a problem. Where does acid reflux come from ? Q. Where does acid reflux come from ? A. Acid reflux comes from acids in the stomach receding into the esophagus, which in turn can cause heartburn, chest pain, difficulty swallowing, regurgitation, dental erosion, and in some cases, asthma. Is acid reflux dangerous ? Q. Is acid reflux dangerous ? A. During an acid reflux episode, stomach acid hits the esophagus which results in a burning sensation. If left untreated, it can potentially cause damage to the esophagus lining. It can be dangerous if the episodes are frequent and left untreated. How long will acid reflux last ? Q. How long will acid reflux last ? A. Acid reflux can last anywhere from days, months, years. The reason and diet of the person can all contribute to the amount of time the symptoms last. If it can be treated by medication, it can be alleviated. Episodes can be triggered by pregnancy and obesity. In those cases, pressure is applied to the abdomen which causes the acid from the stomach to be pushed up to the esophagus. If you are suffering from a minor case, taking an over-the-counter ant-acid tablet may help. Why am I getting acid reflux ? Q. Why am I getting acid reflux ? A. There are many reasons a person can get acid reflux. Your diet has a lot to do with the symptoms. Eating acidic foods can trigger episodes, especially if lying down shortly afterwards. Consuming fatty foods, alcohol, and chocolate can trigger acid reflux. Smoking cigarettes may also contribute. If you are obese or pregnant, your stomach contents may be pushed up due to the underlying pressure on your abdomen. If you are adjusting your lifestyle accordingly, and still have frequent acid reflux issues, consult your doctor. Why my acid reflux won’t go away ? A. Adopting lifestyle changes to accommodate your acid reflux is a start. Avoid foods that are highly acidic. Try to stay in an upright position, especially if you have eaten a large amount of food. Stay away from alcohol and carbonated beverages. If you have taken over-the-counter ant-acid or acid blocker tablets and you have been taking them for over a week, consult your doctor. If you have trouble swallowing or you have started vomiting from your acid reflux, you should also see a doctor. Sometimes larger issues can be masked by acid reflux symptoms, so it is best to get checked out. Can acid reflux be cured ? Q. Can acid reflux be cured ? A. There is a cure for acid reflux! Maintaining a healthy diet and lifestyle can improve and dissipate the symptoms. For severe cases, your doctor can put you on a medication to control and maintain your condition. If your diet changes, or you go off you medication, it can cause irritation and most likely return. A. There are a lot of folk and herbal remedies said to work for heartburn and acid reflux. Marshmallow root taken in a capsule or diluting the dried root to make tea is said to help coat the lining of the esophagus, lessening the heartburn symptom. Some even recommend Apple Cider Vinegar in water, but there are no proven facts or studies to back those claims. Reducing portion sizes and not laying down after eating can be a natural and effective way to reduce occurrence. If trying any of these natural remedies, be sure to consult with your doctor. Marshmallow root shouldn’t be taken by those that have diabetes or pregnant and nursing women. 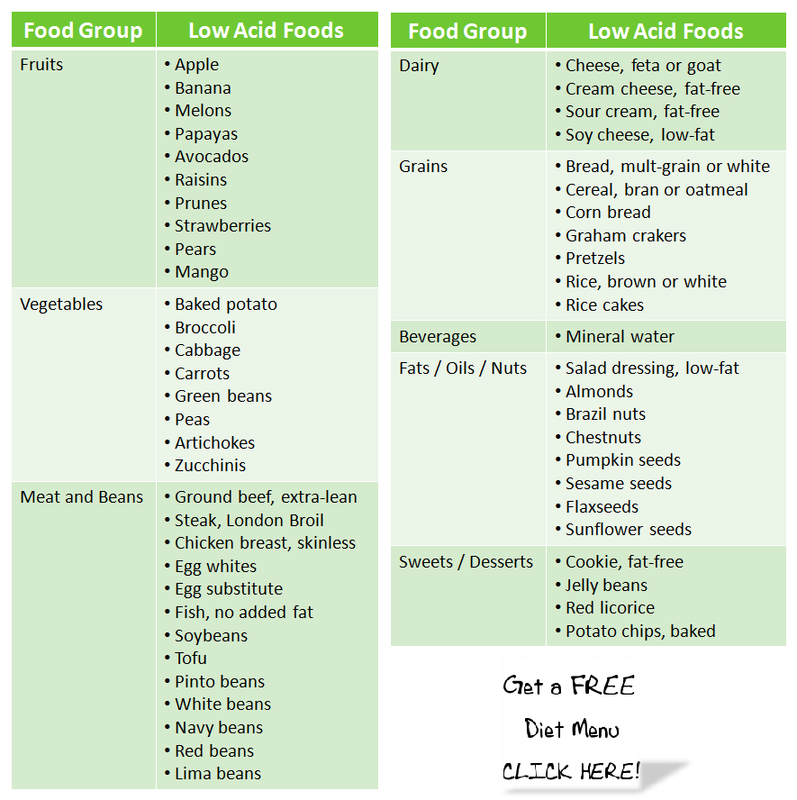 What is the acid reflux diet from mayo clinic ? Q. What is the acid reflux diet from mayo clinic ? A. Mayo Clinic recommends staying away from tomato sauce, alcohol, chocolate, garlic, onion, mint and also fried and fatty foods. What is the difference between heartburn and acid reflux ? Q. What is the difference between heartburn and acid reflux ? A. Acid reflux is when acid is regurgitated into the esophagus. It is possible to have acid reflux and not have any pain resulting from it although heartburn can sometimes be the result. Heartburn is the burning sensation, in the chest, of acid eating through the lining of the esophagus. Heartburn is the result of acid reflux taking place. Can stress cause acid reflux ? Q. Can stress cause acid reflux ? A. Stress can cause acid reflux. When highly stressed, the body manages blood flow differently. The blood flow becomes less in the stomach causing digestion to slow down. When digestion takes longer, it can cause the food to push up against the stomach walls resulting in acid reflux. Eating smaller meals when stressed can help this issue. How to relieve acid reflux pain? A. To the pain caused by acid reflux, try eating smaller meals. Avoid acidic foods as this can irritate the esophagus and cause heartburn. Maintain a healthy lifestyle without cigarettes or alcohol. If you already have a case of acid reflux pain, take an anti-acid tablet. Over-the-counter medications can help coat the esophagus lining and can relieve the heartburn associated with acid reflux. If you have symptoms longer than a week, consult with a doctor. How to stop acid reflux at night? A. To reduce heartburn symptoms and acid reflux at night, eat dinner earlier. Eating before you lay down can cause stomach acid to travel up the esophagus more easily. Remaining upright until you digest your meal will help with symptoms. Sleeping with your head elevated over your chest will also help the occurrence of acid. How to stop acid reflux cough? A. To stop a cough related to acid reflux, you first need to treat it. Often times the esophagus can spasm which causes shortness of breath or coughing. For chronic suffers with these symptoms, you need to treat your acid reflux with a lifestyle change and medication. Medicines that help coughing associated with a cold don’t help your symptoms directly. Since acid reflux is the cause, treating the reflux is the cure. Will throwing up help acid reflux ? Q. Will throwing up help acid reflux ? A. Throwing up will not help acid reflux; In fact, it will most likely make it worse. Once the stomach acid enters the esophagus, the heartburn can damage the lining. Prolonged vomiting will bring more acid up and can cause further irritation and possible damage. If you are throwing up due to acid reflux issues, talk to your doctor. How to stop an acid reflux attack? A. Stop an acid reflux attack by drinking water or purchasing over the counter medications. Prilosec OTC and Tums are stomach acid fighters that can make you more comfortable quickly. Drinking water can also help the amount of acid that comes up. Chewing gum is also said to aid attacks because it causes more saliva production which dilutes the acid that results in discomfort. A. You can get rid of acid reflux in the throat by drinking water that helps the burning of heartburn. Treating the symptoms with dietary and lifestyle changes will also aid in keeping symptoms at bay in the long run. If you chew a piece of gum, it can also help the acid build-up by increasing saliva in the mouth. How to help a baby with acid reflux? A. When a baby has acid reflux, it can be a challenge to deal with. Make sure that you are burping the baby adequately during each feeding. Do not lay the baby down flat on their back right after the feeding. Position the baby upright in a seat or inclined bassinet so that the stomach pressure is less, reducing heartburn related issues. Does acid reflux cause gas ? Q. Does acid reflux cause gas ? A. Gas can cause indigestion and acid reflux, or it can be the result of an acid reflux episode. When food is digested slowly, the food sits idly in the stomach creating a lot of gas in the stomach. When bloating occurs as the result, it can put a lot of pressure on the muscle between the stomach and esophagus, causing acid reflux to occur. Can acid reflux cause nausea ? Q. Can acid reflux cause nausea ? A. Nausea can often times be the result of eating an acid reflux “trigger food”. Avoiding these foods can aid in eliminating nausea symptoms. If you are on a medication for acid reflux, consult your doctor as to whether your medication may bring on nausea symptoms. Can acid reflux cause coughing ? Q. can acid reflux cause coughing ? A. Chronic acid reflux sufferers often times have an acid reflux cough. When the stomach acid travels up the esophagus it can sometimes irritate the throat and result in a cough. When the esophagus spasms and you cough, stomach acid can sometimes end up in the lungs. Can acid reflux cause cancer ? Q. Can acid reflux cause cancer ? A. Acid reflux isn’t directly related to cancer. However, leaving acid reflux untreated for a prolonged period of time can cause a condition known as Barrett’s esophagus. Altered or damaged cells in the esophagus have shorter telomeres. When the ending sequences of DNA strands (telomeres) become shorter, studies indicate can make it easier for cancer prone cells to take over. Does acid reflux cause bad breath ? Q. Does acid reflux cause bad breath ? A. Yes, some people have bad breath associated with the stomach acid content and food particles that can be brought up by the acid regurgitating into the esophagus and into the throat. The odor-causing bacteria can be kept at bay by brushing teeth or chewing gum. Chewing gum is also a great way to keep the stomach acid down that can be a result of reflux. Can acid reflux cause dizziness ? Q. Can acid reflux cause dizziness ? A. Dizziness can be a side effect of acid reflux but this can also be the result of a different condition. Since dizziness, nausea, vomiting and reflux can all be part of a more serious condition, consult your doctor for testing. If you are on a medication for acid reflux, discuss the symptoms with your doctor. Can acid reflux cause stomach pain ? Q. Can acid reflux cause stomach pain ? A. Stomach pain, from a mild cause to extreme, is typically not directly related to acid reflux. It could be the result of eating a trigger food that aggravates the acid reflux. Evaluate and keep track of what you eat if the stomach pain is continual; eliminate those foods from your diet or consult a physician. Where does acid reflux hurt ? Q. Where does acid reflux hurt ? A. Acid reflux can hurt but doesn’t always cause symptoms of discomfort. If you do have acid reflux-induced pain it is generally in the chest cavity and the throat. The esophagus generally feels the burning sensation known as heartburn. Some people just have burping and slight regurgitation not resulting in any pain what so ever.